- Oxygen ( O2 ) . It is striking that the name for the molecule Oxygen is the same as for the atom Oxygen. Actually the Oxygen (O2) we breath is di-oxygen, also called molecular Oxygen. With O2 there are 2 “O” atoms combined together. 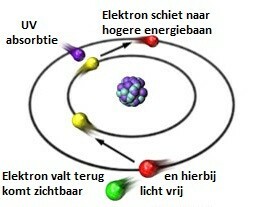 Atoms themselves exist of a nucleus (which exists of protons and neutrons) and around this nucleus circle electrons. And its these electrons that it’s all about with fluorescence. 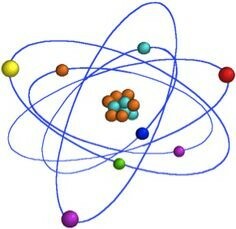 In the middle of the atom is the atomic nucleus, around this nucleus circle the electrons. These electrons turn round in a sort of balance around the nucleus. This balance can in some cases be disturbed by UV-light. 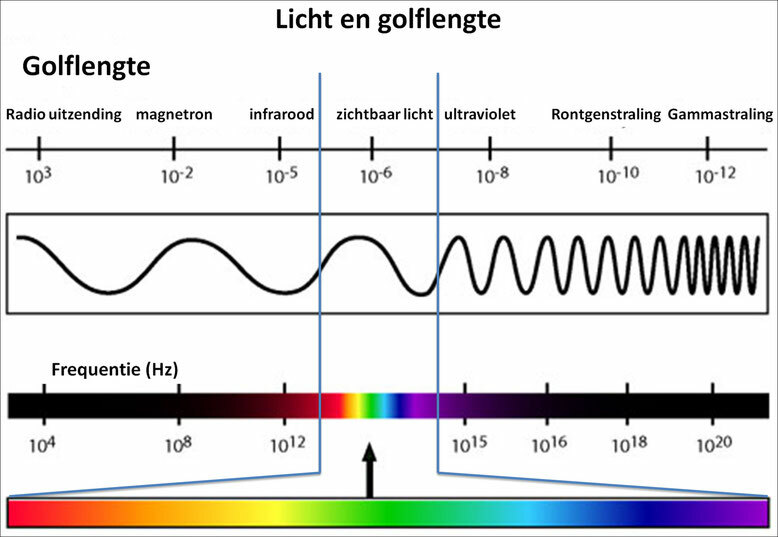 When the energy of UV-light (light exists of fotons, the shorter the wavelength, the more energy it contains) hits the electrons, some electrons get elevated to a higher orbit where there are also other electrons. 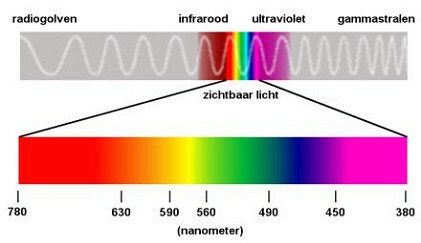 As one can see there is infrared before red and ultra violet after violet. The shorter the wavelength, the more energy it contains. At wavelengths shorter than 400 nanometers , we speak of ultraviolet light. This range can be devided in UV-A, UV-B and UV-C radiation. With fluorescent minerals we generally make a distinction between UV-A, UV-B and UV-C active minerals. There is a large number of minerals which fluoresce under the influence of UV-A light. Wellknown examples are Ruby and Fluorite . Beside these there are a lot of minerals that fluoresce under UV-C light. This is less know/used because of the special lamps with special filters that are needed to see this phenomenon . This is what makes fluorescent minerals so attractive. The diversions in fluorescence are very wide and fluorescent minerals occur in all the colors of the rainbow.